As I don't seem to be getting much chance to draw comics lately, I was delighted when Dillon Naylor offered me a chance to work over one of his "Camilla and Mike!" episodes for Challenge: Australia's National Students' Magazine. 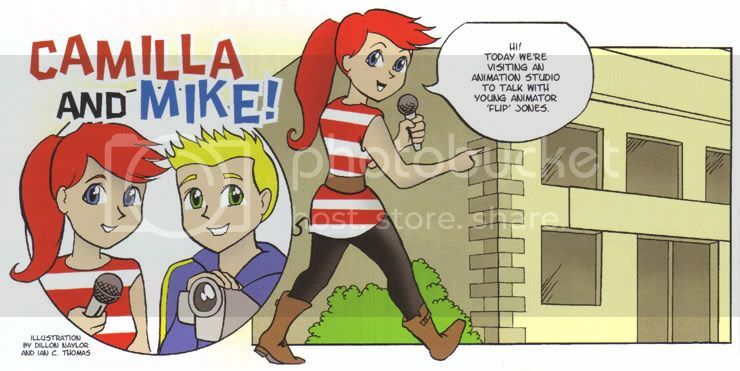 These roving kid journalist characters are regulars in this school magazine, exploring different subjects in an informative and entertaining way in comics form. The challenge was to draw Mike and Camilla in a manga/anime style suitable to his episode, without overly compromising their usual identity. This two pager was a very enjoyable piece to draw and is now appearing in issue number 1 for 2010 of Challenge, available through most schools or iSUBSCiBE.